The bq24618 device is highly integrated Li-ion or Li-polymer switched-mode battery-charge controller. The bq24618 offers a constant-frequency synchronous switching PWM controller with high-accuracy charge current and voltage regulation, charge preconditioning, termination, adapter current regulation and charge status monitoring. 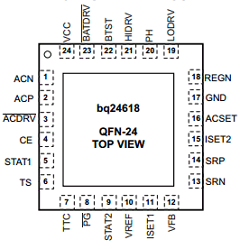 The bq24618 operates from either a USB port or AC adapter and supports charge currents up to 10 A. The device charges the battery in three phases: preconditioning, constant current, and constant voltage. Charge is terminated when the current reaches a minimum user-selectable level. A programmable charge timer provides a safety backup for charge termination. The bq24618 automatically restarts the charge cycle if the battery voltage falls below an internal threshold, and enters a low quiescent current sleep mode when the input voltage falls below the battery voltage.